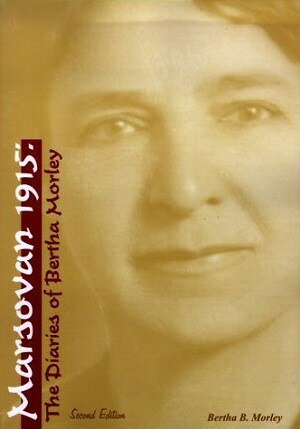 Marsovan 1915 is a critical edition of the diaries of Bertha Morley, an American music teacher in Marsovan (near Kharpert). It is a blow-by-blow account of the Armenian Genocide in Marsovan between April and September 1915. The text was prepared for publication by Hilmar Kaiser. Kaiser notes that the diaries were written for Morley's own private purposes. She records the systematic disintegration of the Marsovan Armenian community: the arrest of Armenian community intellectuals, the methodical deportation of the rest of the population, and the eventual destruction of deportees. Morley narrates how Armenian property was plundered by Ottoman local and central officials and how Armenian women and children converted and were absorbed into Muslim households. She also testifies to the efforts of Ottoman authorities to conceal their criminal activities. July 3. "Clouds don't lift. Priests taken, church and monastery seized.... Emin Bey [military commander], when asked what were to become of women and children, replied: 'The Government has its plans for them.' It looks as if the crushing or annihilation of the race were aimed at." July 9 . "Mr. Zimmer came from Atta Bey and called on officials. He told of many Armenians taking refuge with them, among them Mr. Kassabian and family, Amasia pastor. Mr. Kassabian wrote a letter to Dr. Marden, telling other things, and also something of conditions, perhaps bitter words. The letter was translated into Turkish and sent by telegram to the Vali. Mr. Kassabian was taken away, no one knows where." July 12. "Various families are being pushed out. 600 went out on exile road today, the largest number in any single day, they say. The Atamadjian family has to go. Mrs. Gulbenkian, her four children and her mother were told they must go. They may get a vesika for Samsoun. But she says Prof. Xenides will try to get permission for her to stay till she can get to Europe." July 20. "Companies who left here Tuesday or Wednesday--July 6 and 7--were all joined there [Zilleh]--400 carts in all. Then they went out of the city. Then all the boys were told to come to a certain place to get bread. Her two sons, 12 and 13 years old, went with the others, and one never [sic] came back. They journeyed to within a day of Schar Koeshla. She has a small daughter seven years old also. Various attempts had been made to carry her off, but the gendarmes had prevented it. Sometimes she hid her in the baggage. The mother was made to believe if she turned back she might find her sons. So she turned Moslem and returned. 15 other families talked of coming with her, but did not. They reached Zilleh and inquired for her sons. She was told they were killed." August 9. "There was a large sefkiat from Vank on Sunday--yesterday. A woman came from Vank who reported it. The gendarmes and drivers were cruel. The Kalenderian's were putting a good many things on the araba which they needed; the men threw things off, and beat the women when they tried to put more in, with whips. 250 families were sent, only fifteen were left. The wife of the Kaimakam, of the Commander and others, went to Vank last Friday and picked out three girls and brought them back. Yesterday they went again, after the sefkiat was finished; they stayed sometime enjoying the shade, etc., then picked out four girls--three small and one large. Srpouhi Pestimaljian and her sisters being two of them." Much of what Morley wrote is familiar to students of the Armenian Genocide. The scenarios she describes were also enacted in other parts of the Ottoman Empire at the time. Yet such thematic repetition is of vital significance for the construction of the Armenian Genocide thesis because it demonstrates how deportations, murders, forced abductions, and plunder were systematically carried out under the authority of the Ottoman state. The diaries of Bertha Morley represent a case study of the Armenian Genocide as recorded by an American music teacher in Marsovan 1915. According to Morley there were no Armenians left to speak of in Marsovan by the end of September 1915. Marsovan 1915: The Diaries of Bertha Morley joins Rev. Henry Riggs's Days of Tragedy in Armenia: Personal Experiences in Harpoot, 1915-1917, and Rev. James Barton's "Turkish Atrocities": Statements of American Missionaries on the Destruction of Christian Communities in the Ottoman Turkey 1915-1917 in an expanding documentary series on the genocide of Ottoman Armenians. Bertha Morley (1878-1973) was an American missionary from Mentor, Ohio. She first went to the Ottoman Empire in 1911 and began teaching music at Marsovan College in 1913. In 1915 she witnessed the genocide of Ottoman Armenians. Marsovan 1915: The Diaries of Bertha Morley, Second Edition - Amazon's online bookstore.